Pho was one of those dishes I was always a little afraid to try. Mostly because I didn’t know anything about it. I knew it was soup and many versions contained tripe. Not a fan of animal intestines, I steered clear. Given my fear of pho, I wasn’t sure what compelled me one afternoon to walk into Pho Hung, a popular and oddly located restaurant off SE Powell and 47th. 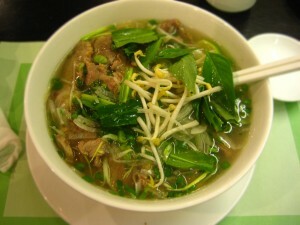 (Pho Hung is a small chain and has a few locations in the Portland area and a couple in Texas, strangely enough). As soon as I opened the menu, my apprehension subsided. Pho Hung makes things very easy for the pho phobic. Options are categorized into Adventurer’s Choice (think lots of tripe and tendons), Everyday Favorites (still somewhat tripe-y) and For Beginners (completely tripeless). Just to be on the very safe side I ordered the chicken noodle soup. The waiter brought a little dish of bean sprouts, basil, lime wedges, and hot peppers, which I had watched other patrons add to their steaming bowls. The broth was salty, rich, tart from the lime and slightly sweet. It had an exotic herbal flavor and aroma I couldn’t pinpoint. The noodles were soft and plentiful, the fresh garnished added texture and bright flavors, and the chicken was tender breast meat. No intestines in sight. The pho at Pho Hung is a fantastic deal at $6.50 for a large, definitely enough soup and noodles to feel satisfied if not stuffed. Those not in the mood for soup can choose from other entrees like bun (vermicelli noodle bowls), rice dishes and other specialties. Even the most expensive dish is under $10. Since my first bowl at Pho Hung, pho has become one of my favorite budget meals. Pho phobic? Pho Hung is a perfect place to break yourself in.